The development of the sewing machine made the mass production of clothing much easier and faster. In the 1840s, Isaac Merrit Singer, a machinist from Boston, designed a lock-stitch sewing machine with a straight-eye pointed needle that moved up and down. It was mounted on a table, which supported the cloth, and rather than being powered by the then-standard hand crank, the needle was worked by a foot pedal. 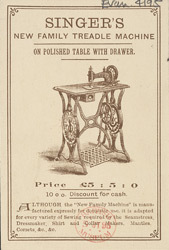 The machine was a great success and soon Singer sewing machines were being used all over the world.